Put the prunes into a small bowl and pour in the prune juice and armagnac or cognac, if using. Stir them together, then set the bowl aside. Tightly wrap a 23-25cm springform cake tin with foil - as the cake is baked in a water bath, this will help stop any water seeping into the batter. Butter the tin and line the base with buttered baking paper. Dust the tin with cocoa powder, tap out the excess, and sit in a large roasting tin. Preheat oven to 170 degrees. Melt the butter in a large saucepan over low heat. 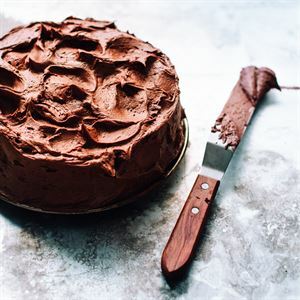 Add the chopped chocolate and whisk it in with a balloon whisk until the mixture is smooth. Take the pan off the heat, tip in the extra cocoa powder and whisk until it's thoroughly incorporated. Now stir in the pecans and prunes with their juice, then set the mixture aside to cool to lukewarm. Tip the eggs, egg yolks, sugar and salt into the bowl of an electric mixer and beat on medium speed for a minute, until the mixture starts to look a bit foamy. Pour in the chocolate mixture and vanilla and whisk again until the batter is well combined. Pour into the prepared cake tin. Now, pour enough very hot tap water into the roasting tin so it comes halfway up the side of the cake tin. Carefully lift the lot into the oven and bake for 1 1/4 - 1 1/2 hours, or until the surface appears to be dry and crusty. When the cake is ready, remove from oven and lift out of water bath, peel away the foil, and sit onto a rack to cool. Cover with the tin and refrigerate it overnight. Loosen the cake with a palette knife. Gently release the sides of the tin and lift the ring away. Invert cake onto a flat plate and remove the base and paper, then sit a cooling rack on top of the cake and invert it again. Pour the warm ganache evenly over the cake so it trickles down the sides. Leave to set, then carefully transfer cake onto serving plate. 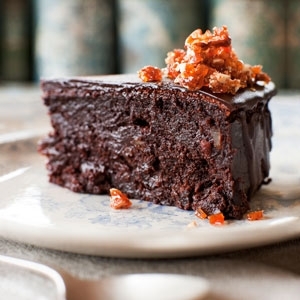 Scatter coarsely crushed praline over the cake, if you are using it, then serve with a bowl of thick cream. 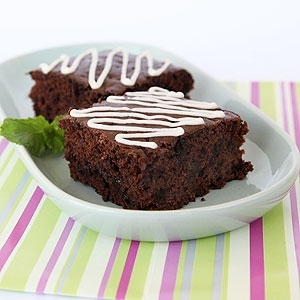 For a variation, omit peppermint essence to make plain chocolate squares. This easy Amaretto cake is one of the most requested by family and friends.